Almost everyone has moles (also known as nevi) on their skin; some have more moles on skin than others. Normal moles tend be one color, round with smooth borders, and unchanged from month to month. It can be normal for a mole to grow slowly over time, but more rapid changes in color, shape or size are cause for concern. Evolving/changing color, shape or size. Dr. David Fieleke and the team at Cornerstone Dermatology are specially trained in identifying early signs of melanoma and other forms of skin cancer from different types of moles on skin. It is wise to have a baseline skin check even if your moles seem normal. If any of the changes that are described above do occur, please have them evaluated as soon as possible. Many types of skin growths other than moles occur on the skin. 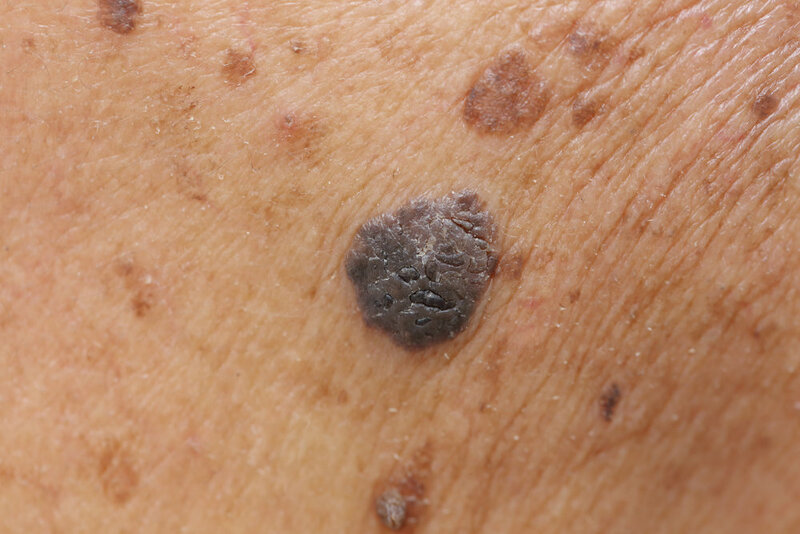 Seborrheic keratoses , also known as senile wart, are an example that are very common in adults. They are waxy, rough bumps that develop a wart-like texture. They are usually brown, although they can vary in color and size. They are generally harmless, though they can become a nuisance if they rub on clothing or grow in areas that are easily irritated. In those instances, a dermatologist may treat the growth using cryotherapy or various other techniques. A biopsy may be performed if there is any question about the diagnosis. Other common benign growths treated by a dermatologist include warts, cysts, skin tags and many more. It is important to have skin lesions checked since some types of growths can be potentially harmful or could even be early forms of skin cancer.